Here is a traditional Irish recipe that makes a high quality, filling and tasty bread. 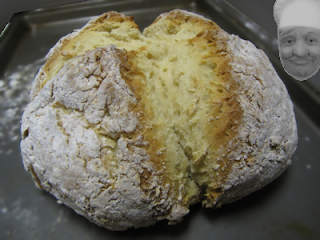 Soda bread differs from regular bread in that it is leavened using baking soda instead of yeast. This is a simpler procedure because, instead of proofing the bread to activate the yeast, soda dough can go straight into the oven where the baking soda does the job of making the bread rise. Here is how I made mine. This was a quick and easy recipe and the result was very good indeed. The salt is an optional ingredient; if you are health conscious you can miss it out completely. Some of the recipes I looked at used large amounts of salt - perhaps the Irish like it that way but my recommendation is to use just a little and throw the rest over your shoulder to get the luck of the Irish. Bake and enjoy.